Fresh seafood, education, entertainment & fun on the Historic Boston Fish Pier! The Boston Seafood Festival in Massachusetts brings together local food vendors in a celebration of some of the nation’s finest seafood. In addition to being able to sample a wide range of food from local restaurants, guests can watch chef demonstrations, participate in an oyster-shucking contest and attend lectures given by industry experts. The Boston Seafood Festival will offer a full day of events focused on educating the public about the local and global elements at play in New England’s dynamic fishing industry. The event will include: Harpoon Beer Garden, Kids Activities, Amazing Food Vendors & Food Trucks (Yes, we will have non-seafood items too! 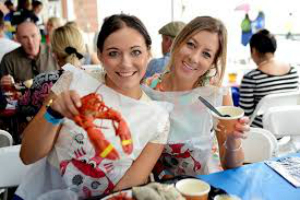 ), Smoothies & coffee, Boston Artists, Sea-Themed Crafts and T-Shirts, Celebrity Chef Demos and fish raffle, Oyster Shucking Contest with cash prizes, Live entertainment, Blessing of the Fleet, All-Day Lobster Bake Tent, Volunteer opportunities, An AMAZING VIEW, and more! !